These Pet Rescue level 55 cheats and tips will help you beat level 55 of Pet Rescue. The objective of Pet Rescue level 55 is to save 5 pets and score 16,000 points. Freeing the pet cages from those narrow pathways is tricky. Since the board always shifts to the left to fill empty space, you can use this to your advantage. 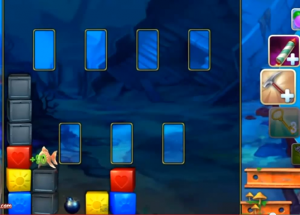 Burst blocks to the left of each pathway so that the pet cage shifts left to fill the void, eventually out of the pathway and onto the main board. There are only a few blocks that are the same color as the pet cages, and you will need every one of them to free your pets. Wait to burst these blocks until you have one or more pet cages touching them, so you can free the pets. 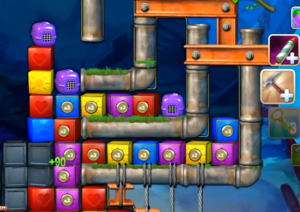 The metal blocks are a huge obstacle in this level, and it is likely that they will stand between one of your pets and freedom at the end of the level. You are given one bomb at the right side of the board. Thoughtfully burst blocks and shift the bomb left until it can explode any metal blocks keeping your pet from freedom. 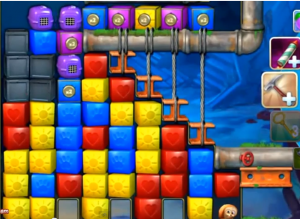 This is the trickiest part of the level, so don’t be discouraged if you don’t get it on the first try.